The author of Miracle at Merion offers a rare, intimate glimpse into the private lives of some of golf's best players. 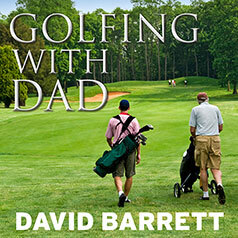 Golfing With Dad is a heartwarming collection of golf's best players' favorite memories with their fathers and how those memories shaped them not only as players but as the men and women they are today. Many professional golfers have been greatly influenced by their fathers, and some of the very best have contributed interviews to this special book, edited by longtime Golf magazine editor David Barrett. The fourteen stories included in Golfing With Dad were contributed by Brad Adamonis, Stewart Cink, Ray Floyd, Bill Haas, J. J. Henry, Peter Jacobsen, Christina Kim, Brittany Lincicome, Kristy McPherson, Phil Mickelson, Jack Nicklaus, Arnold Palmer, Kevin Streelman, and Tom Watson.